Keegan’s Story as told by his mother Krystal. My sweet Keegan was born in June of 2006. My pregnancy was kind of a mess, well not my pregnancy so much as my doctor. During an ultrasound, I was informed that it looked like there was a lack of fluid in my placenta and what appeared to be extra fluid in the brain. I was told not to worry, they would monitor me more closely with stress tests, and have orders for the baby to have more tests and see a neurosurgeon at birth. He would probably need a shunt to drain the excess fluid. I spent the remainder of my pregnancy listening to his heartbeat twice a week. Everything else was fine; there were no concerns from any of the latter visits. I spoke with the woman that was to be his pediatrician and she assured me that it was probably nothing. She said that the OB wasn’t overly concerned and I should not be either, it would likely be nothing at all. I was induced a week early so as not to add any undue stress to the baby by passing my due date. Labor was a breeze, if you don’t account for the fact that induction is literally birth on steroids (OUCH!). Hooray for an effective epidural! Except that post-delivery was a little hazy. It’s a boy. I thought aw man, I was really hoping for a girl! I held him for a moment, before they took him. I woke up at some point and Keegan’s father told me they took Keegan to be monitored because he was having some trouble breathing. He said something about suctioning his nose, causing some irritation, no big deal. Later he told me that Keegan was whisked away to the NICU and that he was secretly terrified and didn’t want to worry me. My baby never did come back to my room. 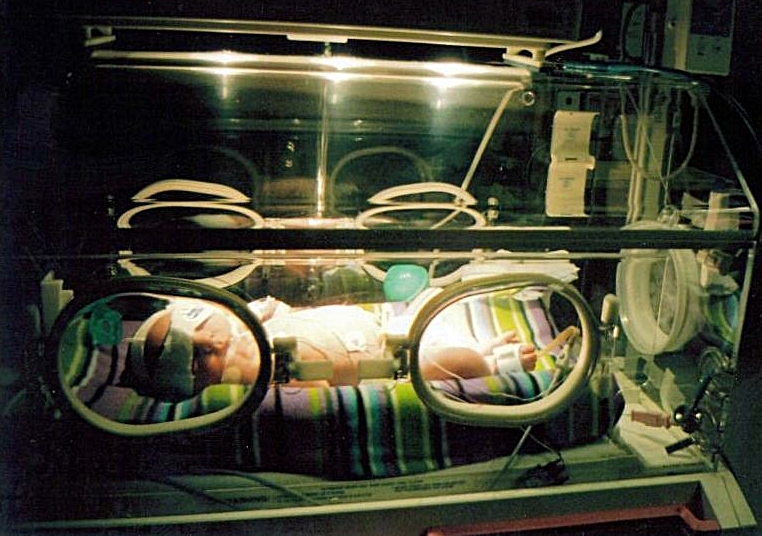 Once I was able to walk, I went to see him in the NICU for the first time. Seeing my baby in a box, hooked up to monitors, tubes and wires. Scrubbing my arms with iodine and putting on a paper gown. Not being allowed to hold him. Not being allowed to breastfeed him. I didn’t know how to react. I don’t remember how I reacted. I think everything just shut off. I looked around at all of the other little babies in that room, my heart ached for every one for their families. I went back as often as I was allowed. The hospital allowed me to stay another day even though I could be discharged. Keegan was breathing better. He wasn’t eating enough, and had to have a tube in his nose. That bothered me. He was jaundiced. I still thought that everything could be okay. After 3 days, a sweet woman asked to meet with us and told us that Keegan saw a myriad of different doctors, had an MRI, and blood work and that he had Septo-Optic Dysplasia. She explained what is was, that he needed hormone replacement, his vision might be affected but it would be a while before we could tell. She was very encouraging. I remember taking the news as if it were orders for battle. Keegan’s dad began to crumble. Harder than hearing the diagnosis was leaving the maternity ward without my baby. Nobody knew how long he would be there. This time I wouldn’t be rolled out in a wheelchair holding my baby. I would have to watch countless other mom’s as I visited the hospital multiple times a day taking their babies home, while I went to scrub my skin with iodine and look at my baby in a box being force fed via a tube down his throat. I had to hold it together. Keegan’s lack of appetite was the one thing holding him in the NICU. The very day Keegan was scheduled for surgery to have a g-tube the endocrinologist put on the brakes . Results from his blood work showed he was growth hormone deficient. She believed once he had growth hormone replacement he would eat better. It would take a little while to get the medication, and I would have to be trained to give my infant an injection but she was insistent we wait to have surgery. At that point, I would have walked across hot coals and broken glass to bring my baby home. I learned to give Keegan his GH shot and taught all of the nurses in the NICU as well. I was there every night to give it to him. After four long weeks, we finally freed Keegan! With his growth hormone levels within normal range, he was eating enough to take the wretched tube out of his nose and go home! I practically ran out the doors afraid they would change their minds. In those four weeks, my entire life turned upside down. I did not have a baby girl to name Isabella. My baby was not okay. I became a single mother after some utterly terrifying events. Nobody could tell me with any certainty what my future would hold. A week after Keegan was released I moved across the state to live with my mom and step-dad, looking for a fresh-start and desperately needed support.